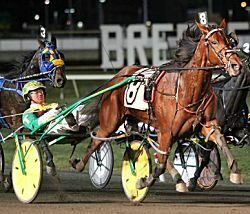 Gallie Bythe Beach was purchased for $280,000 by Hanover Shoe Farms. Lisa photo. A daughter of Somebeachsomewhere out of the mare Galleria, the stakes-winning Gallie Bythe Beach earned $749,898 during her career. She retired in 2016. Her dam was a Dan Patch Award-winner in 1998 and 1999 and added an O’Brien Award in 2000. The family also includes mares Gallic Sea and Gallie Beach, who joined Gallie Bythe Beach on Thursday’s top-sellers list.